95, 55 and 30 gallon models comply with UN Packaging Group 1 (X-Rating) and are certified for use as DOT Salvage Drums, 49 CFR 173.3 (c). 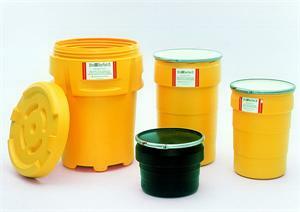 High density polyethylene construction offers excellent chemical resistance, including acids, caustics and corrosives. Convenient, "no tools required" closures are perfect for clean-up and spill response activities. Nestable design and low tare weight allow convenient storage and reduced transportation costs. // Green State Services specializes in absorbent products, absorbent mats, oil absorbent pads, absorbent socs, spill control products, spill kits, chemical absorbents, universal absorbents, oil spill kits, spill containment pallets, containment pallets, containment berms, stormwater management products,storm drain protection, stormwater filtration, oil absorbent boom, oil booms, drum liners, drum handling equipment, clear-view disposable bailers, clear view teflon disposable bailers, environmental sampling products, green stuff absorbents, bio remedial products, x-tex absorbents, roll off liners, workplace safety, industrial safety products, safety products, and roll off dumpsters.